I'm really new in scrapbooking, so I learn to create scrapbooking blogger template style. Infact, is not as easy as I think. I have to crop and resize the digital image to fit the layout size. I usually work with vector file type not bitmap image. 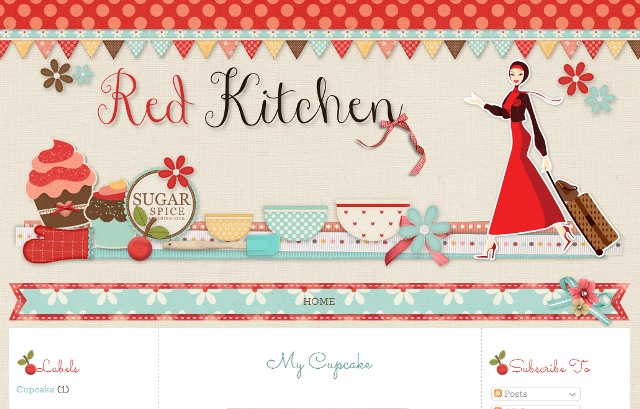 And this is the latest scrapbooking theme of blogger template. Still on progress actually. But you can check the preview. Dominate with red color fit the RED KITCHEN nama, mixed scrapbooking element of cake, flour, sugar, and another kitchen elements. What do you think? waaaaa... new template to girls blogger... enjoy! Looks so cute and I love the colour. "Awesome Blossom" it looks very nice!